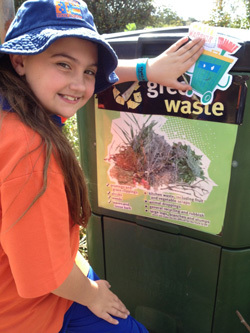 Collecting 500 pieces of playground rubbish in 20 minutes inspired a major behaviour change program at Gabbinar State School, Toowoomba, Queensland. “Students knew that rubbish and plastic affects wildlife so when they saw their impact, they knew their choices have a real impact and they needed to do something.” explained Samantha Ritche, Gabbinbar teacher. Samantha and Marion Elvery worked together with their 50 Year 4 students for the Enviroweek action. 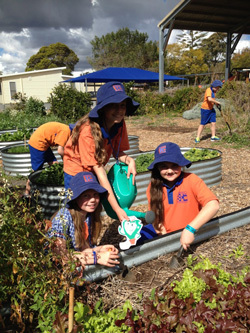 At Gabbinar student food waste is the treasure that creates a thriving vegetable garden used to raise funds, reinforce classroom learning and behaviour change programs. Samantha said the best part about Enviroweek was the ease with which it complemented what was already happening in the classroom. “Cool Australia curriculum provided free lesson plans and teaching resources which reinforce lessons. We found the video snippets and online lectures were excellent. The students were very interested to learn about micro plastics and gardens from these videos, because they were well made, engaging, and presented by a younger person’.